With a history of over 160 years in fine watchmaking, Glashutte Original hand makes each limited piece in Saxony, Germany. The expansive line of watches offers many steel, 18k gold and platinum timepieces for both men and women. Time and an enterprising spirit, however, are not sufficient to make a work of art. Respect for tradition, infinite patience, and incomparable watchmaking expertise are essential. A passionate interest in science and new technologies adds necessary depth to the enterprise, and exuberant creativity breathes life into the craft. Still more is required – an image of human intelligence. The ingenious turns of the watchmaker’s mind must find expression in extraordinary movements and complications in exquisitely finished components and harmonious design. In the name Glashutte Original lies the history and unique heritage of a small town in Germany. For centuries, the fate of Glashutte depended on the mines dug to extract silver, copper, lead and iron ore buried in the mountains of Erzgebirge. 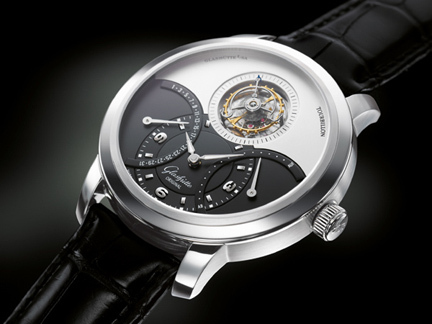 When the ore gave out in the early part of the 19th century, the citizens of Glashutte began to look for alternatives. There were no immediate opportunities in sight, yet not far away lay Dresden, the splendid city on the Elbe river once known as the Florence of the North. The seat of an enlightened Saxon Court, Dresden had long nourished the nascent art and science of keeping time with the aid of clocks and pocket watches. At the same time, the excitement of the industrial revolution had captured the imagination of adventurous thinkers and entrepreneurs all over Europe, and Saxony was no exception. It was this spirit of adventurous enterprise that slowly transformed Glashutte from a remote village in the mountains into the world-class center of handcrafted watches that it remains today. The first watchmaker-entrepreneurs in Glashutte set out to build an industry based on knowledge. Traditional watchmaking skills were taught in a systematic manner and handed down from one generation to the next. Advances in science and production technologies, improvements in tool and die-making machinery, and the passionate dedication of master watchmakers created a culture of excellence that has lasted to the present day. Glashutte Original preserves this history as a previous heritage, the original and authentic spirit that lives in the brand today. All Glashutte Watches Have Been Sold.